What that title means, is that this album is worth listening to, many times, and at a very high volume. This album follows down the road that Kyuss started down with "Welcome to Sky Valley". But they are much further down the road. If you want something that resembles the intensity of "Wretch" or "Blues for the Red Sun" you probably aren't going to find it. In my humble opinion, this is their least 'metal' album. That being said, Josh's guitar seems to be tuned down even more, and John sounds as gruff as ever (though he does pull off some nice harmonies, showing the softer side of his voice-think demon cleaner). Scott Reeder returns as bassist for this album, as he did Sky Valley, this album's predecesor. Brant Bjork is gone from the mix, and the new drummer is Alfredo Hernandez. The album seems to strip down the feeling from Sky Valley, which had 6-7 minute epic songs, and turning them into 4-5 minute rock masterpieces. 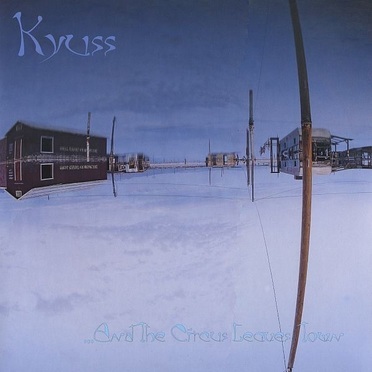 It took me the longest time of all the Kyuss albums to get completely addicted to "...And the Circus Leaves Town" but now it is the Kyuss album I listen to the most. And as a final note, the band on this album, is pretty much the band Josh used for the first Queens record. subtract John Garcia on vocals, give Josh vocals and guitar, and throw Dave Catching in the mix on guitar/steel guitar and you pretty much have the Queens of the Stone Age that did their self titled album.